People often show hunger when they are pursuing a prize for the first time. Something can happen to their energy, however, if they win the prize and have to defend it. They sometimes find it difficult to show the same hunger. Peak performers rest and rejuvenate themselves after gaining the prize. They then continue to show the energy of being a challenger, rather than resting on their laurels as champions. Such people often pursue something greater than themselves. They aim to follow their inner compass, pursue a mission or make the best use of their talent. They have a burning desire to serve this mission and become the best they can be. They are committed to pursuing certain principles. These often include following the ethic of constant improvement. Sometimes, as a by-product, they continue to win prizes. Some people, however, find it difficult to access the same passion they had when pursuing the original goal. They protect what they have, which can result in them standing still. They may even go backwards whilst other people go forwards. Peak performers choose to adopt the psychology of the pursuer – rather than the pursued – even when they are in the lead. They look forwards and set new goals for themselves. They realise it is hard to run fast if you spend all your time looking backwards. Looking at your life, can you recall a time you chose to have the hunger of the pursuer, even after achieving your original goal? You may have reached one target or taken the lead, for example, but then chose to pursue new personal aims. Here are examples of what people have said when answering this question. I followed a disciplined diet to achieve a certain weight and then continued to keep myself healthy. I strived to win a sale and then threw myself into giving superb service to build a long-term relationship with the customer. I became Number One in my sport and then set new personal goals that resulted in me being Number One the following year. Describe a specific situation in the past when you chose to adopt the psychology of being the pursuer. Describe the specific things you did to adopt the psychology of being the pursuer. People who take these steps are often committed to constant improvement. They apply this approach in a positive way, however, rather than feeling neurotic. This approach can often been seen in sports. Let’s look at two examples from soccer. They had won their league by getting 94 points with two matches remaining. The coach gathered the players together and gave them the following message. “We now have a choice. “We can aim to do our best and set a new target of winning the final two matches to get 100 points. Alternatively, we could choose to rest on our laurels, stop doing what got us to this point and go through the motions. “I want us to for the first option. This will only work, however, with players who are committed. The whole squad turned up and gave their best. The team won one and drew one of their final two matches. The draw resulted from a poor refereeing decision. Nevertheless, the team felt they had done their best and took time out for a short celebration. They then carried this ethic into the next season. They gained enough points to win the league with three matches remaining. They then partied for 3 days. The players stopped doing what had won them the prize. They stopped working hard, stopped follow good habits and, for the remaining three matches, stopped winning. The whole team then embarked on a three-week celebration. Feted by the fans, they became celebrities and this led to individual players signing big sponsorship deals. The team had been successful by working for each other and, in the process, surprised many doubters. Pat Riley, the former basketball coach, described this phenomenon as ‘the innocent climb’. He also warned that, after gaining success, this could lead to what he called ‘the disease of me’. This is what happened with Team B. The players stopped working for each other, which was the basis of their game. The team made a poor start to the new season, which eventually led to the coach being fired. The players eventually began to follow some of their previous good habits. But they never achieved the same ongoing success as the players in Team A. Peak performers who choose to adopt the psychology of the pursuer often demonstrate certain characteristics. These include some of the following. People who do fine work often aim to serve something greater than themselves. They may aim to pursue a spiritual faith, a mission or a sense of vocation. Such people often pursue an inner goal. They aim to use their strengths and do their best to serve this calling. They then translate this drive into working to achieve outer goals. They may achieve what others perceive to be success but they still feel dissatisfied. They keep focusing on improving their personal best, even though they might have already lifted the prize. Such people want to feel they have given everything. John Wooden, the famous basketball coach, explained this in the following way. People who follow this approach often have a pattern of pursuing their passions. They go through the stages of absorption, adventure and achievement. They keep going until it feels right and they satisfy their inner goal. Peak performers often return to pursuing their principles when facing challenges. One golfer was in sight of winning his first major championship, for example, but then dropped a shot with three holes remaining. He chose to focus on his deepest values, however, rather worry about missing out on the prize. He followed a positive mantra by saying the following things to himself. Stay calm. You have many assets in life. You have a loving partner and a wonderful family. They are the most important things in life. Remember why you became fascinated by golf. You loved to go out onto the course, stay in the moment and hit the ball sweetly. You can follow this process over the next two holes. You can do what you believe in rather than worry about the prize. The golfer played the final holes beautifully and eventually won the tournament. People can choose to pursue their principles in challenging situations. This does not always guarantee winning prizes, but it does guarantee that they have been true to themselves. One person took this approach after being diagnosed with a serious illness. They explained this in the following way. Several years ago I was diagnosed with having the early stages of a cancer. This came to light because I had been having regular health checks. Like many people in such situations, I explored all the options to educate myself. This called for doing extensive research and eventually opting for a certain kind of treatment. I chose to get on with enjoying life, however, and reframed treating the illness as a project. This meant doing everything possible to deal with the illness, but not being defined by it. 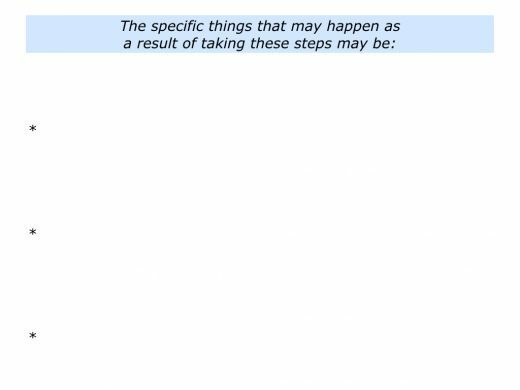 I crafted a script to follow when explaining the situation to people. This went along the following lines. “As we know, these kind of situations teach us a lot about what is important in life. So I am getting on with doing those things. The treatment is excellent and the chances of recovery are high. The responses people gave were interesting. Many said they appreciated the messages and these had got them thinking about their lives. Some people gave another response. This was along the lines of: “You can fight it.” Whilst understanding their good intentions, I explained that I had another approach. I like to fight for something rather than against something. I wanted to put my energy into doing the things I enjoyed in life. The illness needed to be tackled with every possible means, but it was a project. Several years have passed. Sometimes I get ongoing treatment, but many people have more difficult challenges. In the meantime I simply get on with doing the important things in life. Let’s explore another step taken by people who follow this approach. Different people follow this mantra in different ways. Some do it by aiming to follow their vocation. 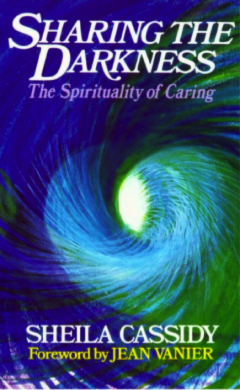 Frederick Buechner described pursuing such a mission in the following way. Randy Pausch embodied aspects of this approach in his famous Last Lecture. Millions of people have been inspired by his talk called Really Achieving Your Childhood Dreams. Peak performers focus on constant improvement. After reaching one goal, they set aside time to rest and revitalise themselves. They then look ahead to create new goals in their life or work. Different people follow this approach in different ways. Sheila Cassidy, for example, aimed to use her own experiences to help others. Trained as a doctor, she was arrested and tortured after treating an opponent of the Pinochet regime in Chile. Sheila was eventually released and went on to become Medical Director of St. Luke’s Hospice in Plymouth. Writing in her book Sharing The Darkness, Sheila describes her first meeting with a patient. How can I keep encouraging others? How can I help both present and future generations? How can I do my best today? 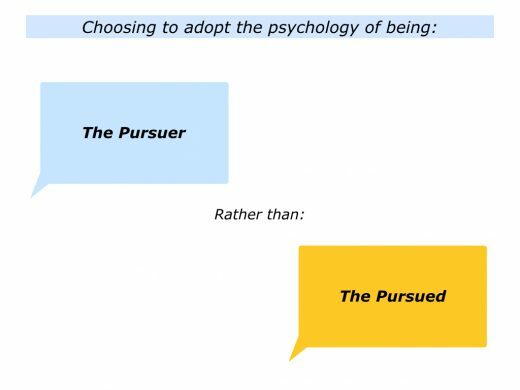 Different people choose different ways to adopt the psychology of being the pursuer rather than the pursued. Sometimes it may involve setting new goals after reaching their original goals. Sometimes it may involve something deeper. It may mean pursuing their spiritual faith, mission or vocation rather than worrying about prizes. They may believe, however, that pursuing their principles is actually the greatest prize. Looking at your own life, how can you continue to be proactive? How can you continue to follow your inner compass? How can you choose to pursue what you believe in rather than worry about being pursued? 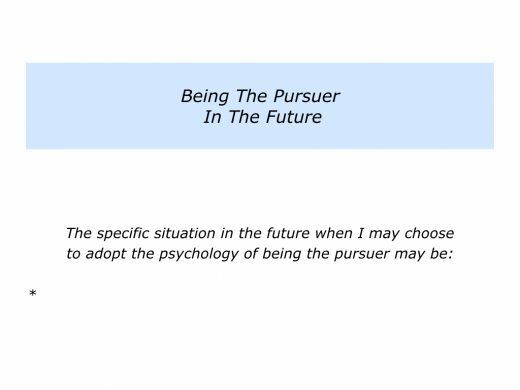 Describe a specific situation in the future when you may choose to adopt the psychology of being the pursuer. Describe the specific things you can do then to adopt the psychology of being the pursuer.